Anyone identify these vintage cycling glasses? Can anyone remember what type of sunglasses these are? They were worn by Luis Herrera and Charly Mottet in the picture below. 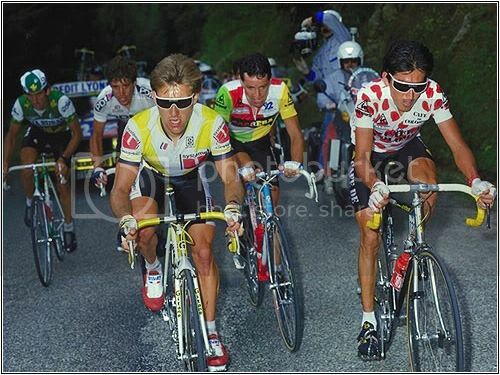 They were fairly popular in the peleton during the late 80s. I used to own a pair, and would love to find another. I just can't for the life of me remember the model or maker. My googling efforts get me nowhere. Anyone know? My wife and daughter will ridicule me, but I don't care. Rudy Project - I don't remember a model name... maybe they only had one at that time. Last edited by DiabloScott; 05-29-15 at 01:40 PM. ... My wife and daughter will ridicule me, but I don't care. I didn't remember them being Rudy Projects, but those do look the same. I sort of, kind of remember them being French, but I've mis-remembered things before. Here's another great pic of Luis Herrera (source). These don't have the retro heritage but they sure are inspired by it and heavily worn by the current pros. Better quality and fit and much easier to get than the old ones I'd think. Oakley did a bunch of re-issues recently as well but I couldn't find them on the site. ^Thanks for link @jianshi. I'm familiar with The Rules, but hadn't seen that particular article. Relevant: from a BF poster and blogger. Yep, Rudy Project. I was the NorCal rep for Veltec-Boyer back then, sold a ton of 'em. They came in over a dozen colors, retailed for around $40. There were more than one model, but the basic one with plastic temples were 95% of what I sold. There was another model with a bendable metal temple that you could "mold" for a better fit. I liked 'em, but those weren't a big seller. I remember stopping in at Palo Alto bikes on a sales call, and Jobst Brandt was up in the office holding court. He showed me a pair of broken Rudy's and demanded an on the spot warranty, classic Jobst. I pulled out my sample case and let him pick one. In the 80's, if you didn't have the bucks for Oakleys and wanted to be stylin', you wore these. OH YEAH, those are some kinda wonderful! I dunno about GBP 74.99 wonderful, though; isn't that like $100 or something? ^More like $115 (plus shipping). The cost of cool. Oakley had the Factory Pilots just like those in the mid-late 80's. I had a pair when I was a runner, and they were "stolen." I found the person who had them, at the next 10K, and she was persuaded to give them back. Eventually, the sweat band wore out, and Oakley replaced it free. They were stolen again a couple of years later. They'd be perfect riding glasses. Back when I owned some, I thought cycling was silly. Last edited by RobbieTunes; 05-29-15 at 06:20 PM. I thought cycling was silly. I believe I have a pair of the plastic Rudy Projects in silver-gray with smoke lenses. But with all the water under the bridge I may be mis-remembering details. If somebody really wants a pair, PM me and I'll fish them out. Why are they wearing sunglasses in the dark? Dark? Maybe it's a sunny day in the Pacific Northwest. That's me in blue, and a buddy doing AMBRR around Tahoe - it was JUNE and a storm came in and it SNOWED. I always have eye protection... didn't know I'd need clear ones. Since no one seemed to answer the OP's question (EDIT: Oh nevermind I must be blind, gaucho got it), the sunglasses in the first post are Rudy Project Performance or Super Performance (same but with vents to prevent fogging and a sweat pad). 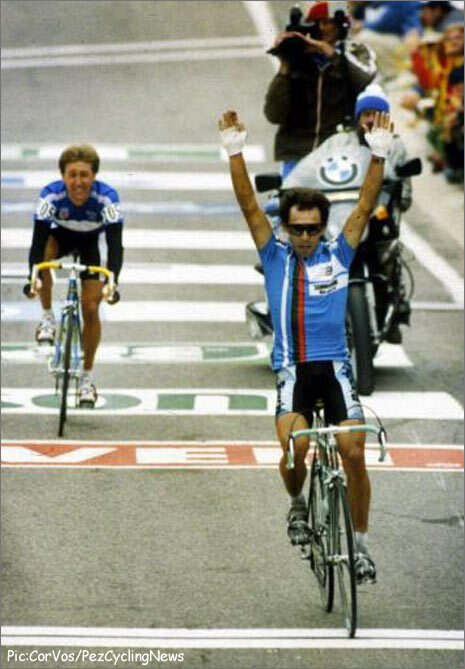 They were released in 1986, most famously worn during Bernard Hinault. Last edited by GhostSS; 07-15-15 at 01:33 PM. Sagan is rocking them, or at least something similar, this year. Love that guy. 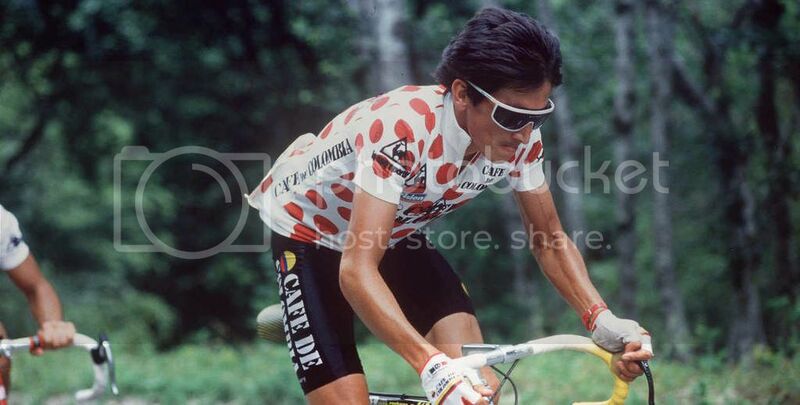 I have 2 pairs, a neon yellow pair (A la Mottet) and a charcoal and red pair (A la Hinault). Has great peripheral coverage and wind blocking. It does look rather super 80's robo-copish , but I like them. Compared to my Oakley Razor Blades, the Rudy's have slightly better coverage, but the Blades have a more comfortable and secure nose piece. Last edited by GhostSS; 07-15-15 at 09:02 PM. I road with these back in the day... they couldn't of cost more than a 10 spot back then.